It was a hot Sunday afternoon when I got dragged out, by my fuming grandfather, of an interesting Hindi movie and was entrusted to the vidvan whose tutelage and guidance was an eye opener to the long path into the realms of the quintessence of Carnatic music. Taking me into his caring fold with the delightful beginning with ‘Muladhara murti’ in the raga Hamsadhvani, that very afternoon, Sangita Kalanidhi Shri D K Jayaraman led me on to the royal concourse to satsangita. A staunch believer of the ‘no end to learning’ concept, Shri DKJ was a keen collector of compositions, though he himself was a repository of a huge repertoire of compositions, both traditional and contemporary. 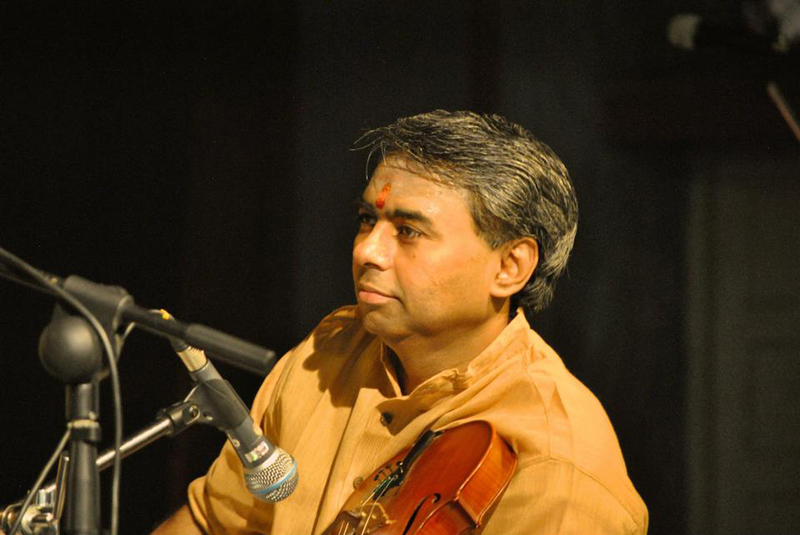 Shri DKJ was much renowned, amongst his very many other strengths, for his bhava-laden renditions of compositions. Who can ever forget his immaculate renditions, especially of ‘Raghupate Rama’, ‘Ranganayakam’, ‘Mayamma’, ‘Sendil Andavan’ and ‘Manadirkkugandadu’? He would constantly be on the lookout for newer compositions and would go all the way to learn them, shape them and present them in concerts. He was an adept in imparting to the compositions a new breath of life and many such creations of contemporary composers have thus seen the light of the day. The process by which these compositions acquired that sheen of class under his magical treatment was indeed a treat to witness. Having imbibed extensively the nuances of the art during the teaching sessions for Smt DKP by stalwarts such as Shri Ambi Dikshitar, Shri T L Venkatarama Iyer, Shri Papanasam Sivan and many others, Shri DKJ was much at ease in presenting a composition with grandeur. Incorporating time hallowed phrasings of the raga, highlighting the feel of the sahitya and repeated renditions of the songs in his inimitable charismatic style would enable the composition to last for years to come. ‘Duty is God’ was Shri DKJ’s favorite and most important advice to his students and he insisted on instantaneous action. He would quote freely from various great authors and many a time they would come handy in appreciating the kritis. Often there would take place discussions on varied subjects- ranging from ‘Kalyani’ to kanchipuram idli, ‘ini oru kanam’ to income tax returns, Annangarachariar to Azharuddin and brhadeeshwara temple to bisleri soda!!! And the result of the heat generated during the discussions has been of great benefit later even in trivial day-to-day issues. Simple at heart, lofty in ideal, practical in life Shri DKJ gave all of himself much endearingly to his shishyas. He would take great care of their progress and development and would go all the way out to make them shine as stars in the music horizon. His shishyas had the unique benefit of interacting with him on a personal level so much so that Shri DKJ was the most important member of the family of every shishya! The warmth and affection that he always radiated remains unsurpassed. ‘Asha deera dUra dEshamulanu prakAshimpa jesina rasika shiromani…DAsharathi nee ruNamu deerpa nA taramA’??????? ?